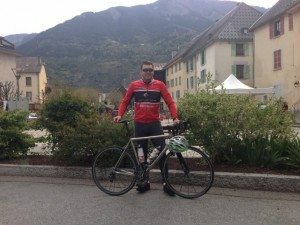 Star Physio’s Principal and Bikefit expert, Damian Oldmeadow, has recently returned from a cycling trip to the South East of France. Check out this blog for an overview and thoughts. 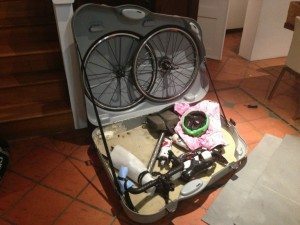 We flew Emirates and with their generous baggage allowance of 30kg per person we had no issues with bikes as part of normal baggage. We arrived in Lyon, picked up our hire car and headed South to Chateauneuf du Pape, a famous wine region in Provence which was to be our base for the next week. 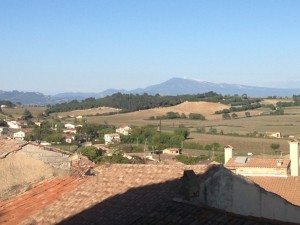 From our accommodation we had a great view of our major challenge, Mont Ventoux! 2. Lesson Number One… Check the mountain weather regularly! So we decided to tackle the 21km brute of a climb from Bedoin on day 1. We checked the mountain top weather in the morning and it appeared to be cold but clear and not too windy… Mont Ventoux basically translates to “windy mountain”. Due to a few mechanical issues we did not get up the mountain until the afternoon but we did not recheck the weather. It had turned into snowfall and sub-zero conditions in a matter of hours which we learned about at the top. The second part of this lesson was that Perth winter cycling attire does not cut it in French winter conditions! It was cold… really cold, and icy and slippery. We were shaking so much and our hands felt frozen solid so we needed to stop every few hundred metres to attempt to warm up a bit. Thankfully we made it to the ski station about 6km back down and got in some hot coffee which helped to defrost us. Over our 3 hours of cycling our average temperature on the bike was 1deg not accounting for the wind chill. The good news is that the climb was amazing and the thought of the professionals racing up it at crazy speeds really made us realize what incredible athletes they are (drugs or not!). For the bike tech people I rode it comfortably using a 34/27 compact with some long sections at well over 10% gradient. I would not have wanted to tackle it without the compact chainring! 3. Lesson Number 2. Beware of things falling out of the back pocket. Next climb to tackle was the legendary Alpe D’Huez- a mere 13km but with its legendary 21 switchback turns. We drove North to the Alps after carefully checking the weather to reach Le Bourg D’Oisans at the base of the legendary climb. The scenery was spectacular and the weather good… but we came prepared with every bit of cycling kit we owned just in case! This proved to become somewhat of an undoing as near turn 6 my spray jacket slipped out of my back pocket and wrapped around my rear derailleur ripping it clean off the bike! Once I mentally recovered from the damage to my pride and joy I rolled back down the hill, got towed into town and picked up a hire bike to do it again! The second attempt apart from being on a different and not well fitted bike, was sensational. 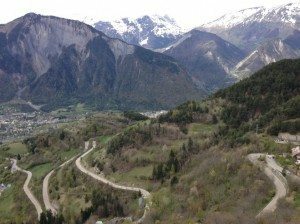 The constant switchbacks gave an amazing view of the valley and the surrounding Alps and riding through the ski station at the top brought back memories of enjoying many late nights watching le Tour de France. 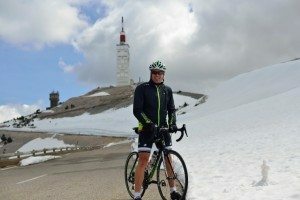 After some enjoyable flat rides in Provence and along the Rhone river, we decided that we should tackle Mont Ventoux again but from the other side. As my bike was completely out of action it was off to the Ventoux Bike Hire in Malaucene for another rental. After the back and hamstring pain I got in the Alps on hire bike number one, I took the time to use my bikefit measurements and set this bike up properly which made all the difference. The climb from this side was different and was straight into 11% early but gave us a few more gentle sections on the way up. Another gruelling 21km climb and cold at the top but clear and no snow made for a great ride and amazing views at the top! Unfortunately that brought about the end of the holiday and the next day was a drive south to Nice and the flight back home. This brings me to the final lesson! The only thing more upsetting than seeing a busted bike box is a busted bike. 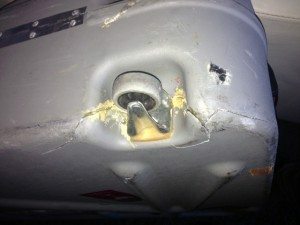 My bike inside was fine and Emirates are paying for the repair of the box. I would hate to think how my bike would have looked had it not been in a good case! • Use a compact or triple chain ring. 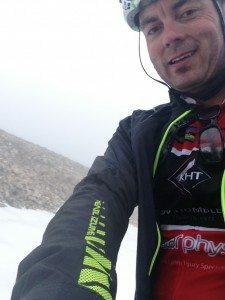 Unless you are a mountain goat it is really hard to comprehend how long and steep these mountains are and it is particularly hard to train for them well in Perth hills. As a comparison, Welshpool road, depending where you measure it from is around 6km at an average of around 4%, with a short section around 8%. Mont Ventoux is 21km averaging over 8%! • Drink lots of Champagne and Red Wine and eat lots of cheese and pastries!